Teenagers are everywhere recently. At CAMH, where their art impressed me mightily. 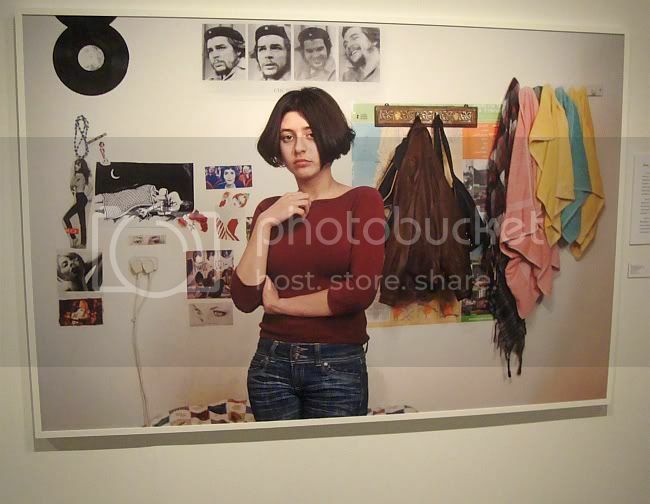 In Rania Matar's photos at De Santos Gallery, which got praise from Dean Liscum. 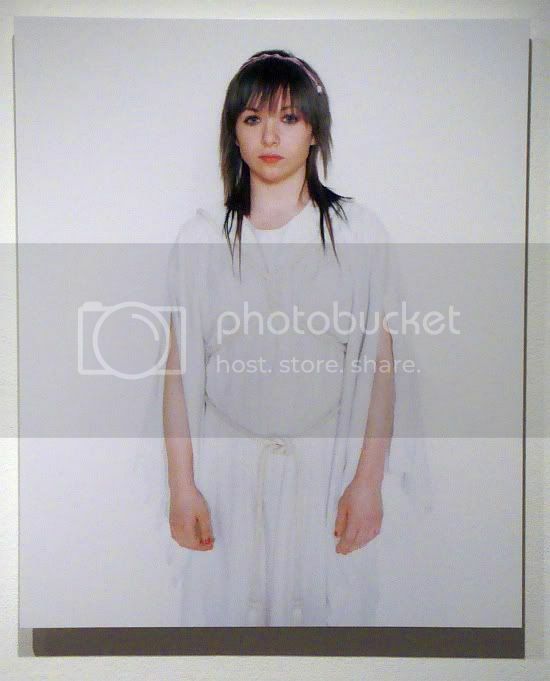 Now Matar is part of a group show at the Houston Center for Photography called Teenagers: Portraits of Identity and Expression. This show has a bit more of an edge than Matar's solo show. Some of the work, including Matar's, is political. Some is unnerving. Don't mistake me--the work isn't shocking or transgressive. This is not a Larry Clark show. But the viewers aren't meant to be completely comfortable with the images. 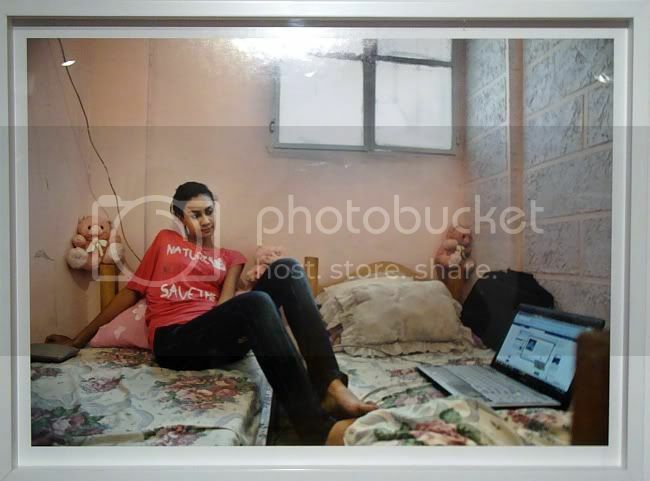 Matar specializes in photographing teenage girls in their rooms. In this selection of eight photos, four of them are girls in the Middle East (Beruit and Jerusalem) and four are girls in New England. There is not enough information to draw conclusions (not to mention the small sample size). Some of the Middle Eastern girls seem fairly prosperous. But the biggest difference is how much stuff there is in the American girl's rooms, especially on the walls. This contrasts mightily with the most affecting image, Marwa 18, Shatila refugee camp, Beirut Lebanon 2010. She has a computer, but otherwise her room is so barren. This may reflect her status as a refugee women (probably born there--Shatila has been a refugee camp since 1949). The room has two beds, extremely close to one another. She may have a roommate (a sibling?). She is casual, connected to the world with her computer. But her room looks like prison cell--a rather feminine cell with pink walls and teddy bears. The American teenagers, in contrast, have a horror vacui. They tend to cover as much of their walls as they can. But putting lots of stuff on the walls isn't an exclusively American thing. 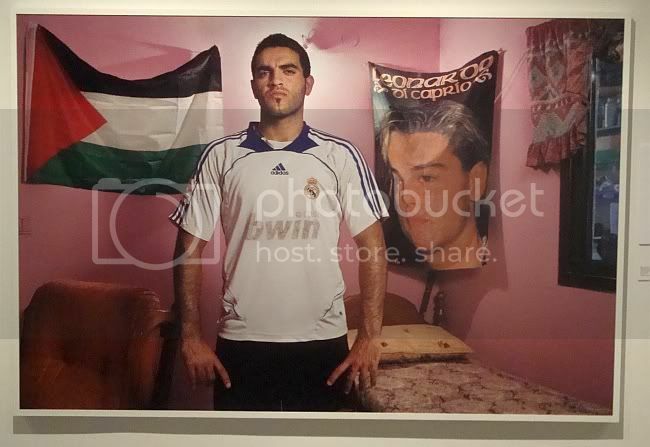 Natan Dvir also photographed Middle Eastern teenagers, specifically Arab teenagers in Israel. I was born in Ukraine to a Jewish Russian mother and a Muslim Israeli father who met in medical school. I moved to Israel with my family at the age of five. My family lives in Taibe, a Muslim city in the triangle area that is heavily populated by Arabs. I didn't really like living there and felt oppressed as a woman in that culture. My mother could not work as a doctor and had to open up a boutique for brides. Boys and girls remain separated. There are hardly any places to go out. I was able to hang out with my friends only at our homes or in Jewish cities. I joined the Communist Youth Movement, but everyone was always trying to prevent me from organizing activities. My parents encouraged me to leave Taibe and find a place where I felt more comfortable socially and professionally. I am now living in Jaffa in a collective of Arab and Jewish human rights activists and volunteer in various organizations. I don't really care if I live with Arabs or Jews. I guess I kind of did that all my life anyhow. I appreciate people for who they are and have little regard for that kind of categorization. I am both jewish and Muslim; both Russian and Israeli. I can't be defined any way that makes you feel comfortable, but if you ask me, I would prefer not to be called any of the above.--I am a human rights activist. 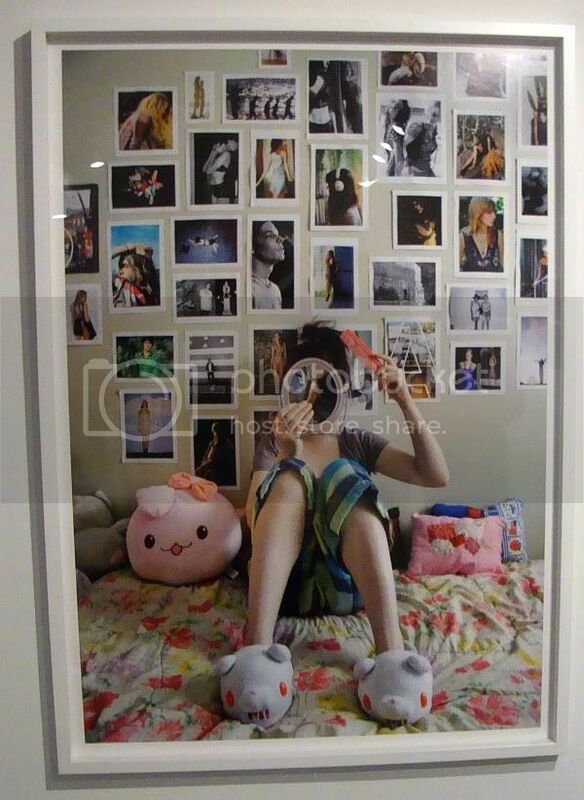 But like an American teenager, she has a lot of stuff on the wall. We see images of Che Guevara above her, and a grouping of disparate images to her left. 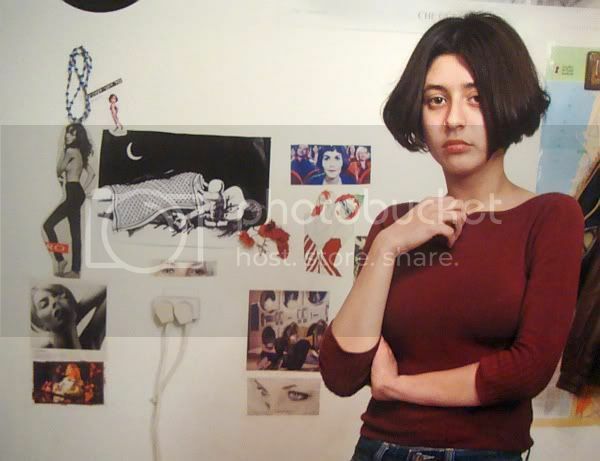 We see fashion photos and a still from Amelie alongside a pointed Egyptian political cartoon. Her wall is her biography. Ehab's story is that of a soccer-mad Arab boy whose opportunities for playing at a high level are frustrated by politics. But his ambition shines through in both the text and in his defiant stance. These were the weirdest photos of the show. Alison Malone was a member of a Masonic organization for girls called Job's Daughters. She returned to the organization as an adult to photograph its members and record it as it slowly dies out (membership peaked in the 1970s). My first reaction was that this was some cult-like thing, but reading about the organization and hearing Malone's account of her project gave me a different perspective. (You can hear Malone describe her project by dialing 713-300-9919 ext. 5.) She sees Job's Daughters as one of the first groups that a girl joins on her own (as opposed to being in her parents' church or going to school), and training for adulthood in that the groups are self-organizing (although on a rigid pattern, as in all Masonic organizations). Perhaps Job's Daughters is dying out because all old-school voluntary organizations like the Masons are dying out (see Bowling Alone). Malone also spoke of being attracted to the costumes and the ritual and the role-playing that went with being a Daughter of Job. 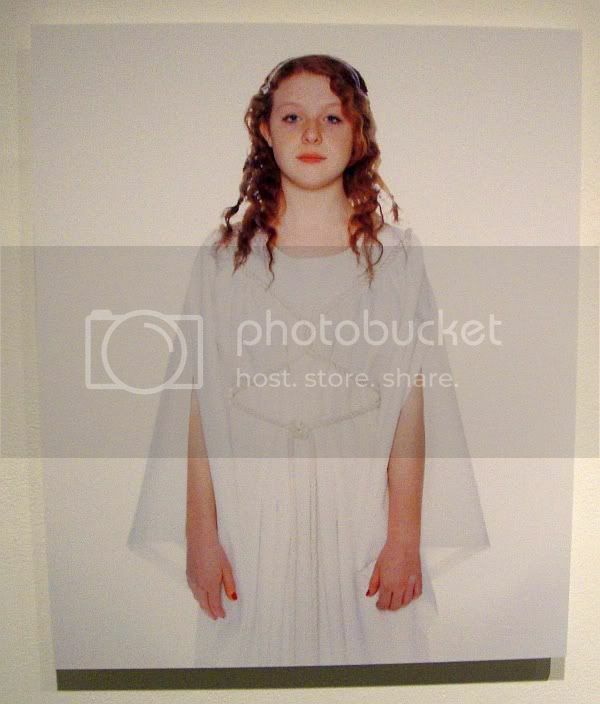 The costumes are what is striking in the photos. I wonder if taking these photos and displaying them might not give Job's Daughters a boost? Or does membership in Job's Daughters depend on having an adult Mason sponsor you? All the photos from this exhibit can be seen online, but it's worth going to the HCP to see the large, vivid prints--and in the case of Natan Dvir's photos, to read the statements by the subjects.